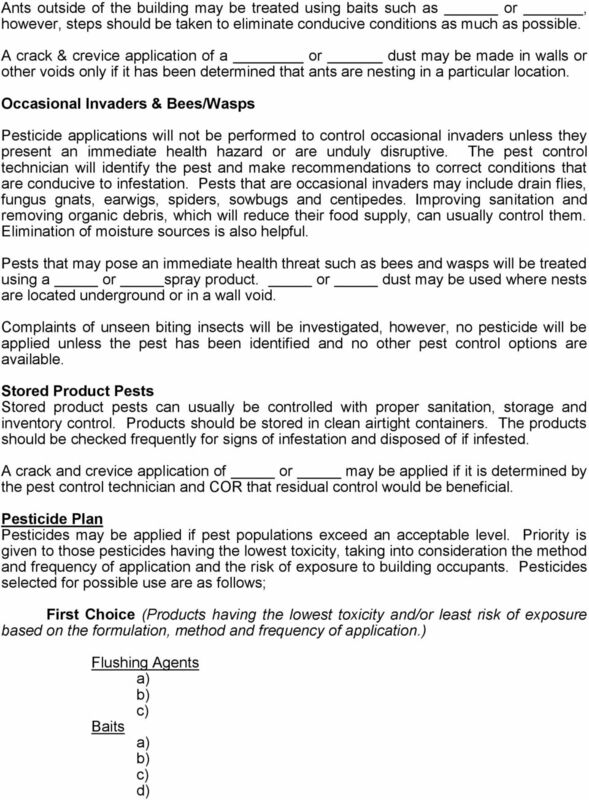 Download "Sample Integrated Pest Management Plan. General Pest Control. Facility Name Address Telephone Number"
1 Sample Integrated Pest Management Plan General Pest Control Facility Name Address Telephone Number Pests to be Controlled Pest control services which can be performed in the General Pest Control category includes cockroaches, ants (other than carpenter ants), winged termite swarmers emerging indoors, incidental/occasional invaders including bees & wasps entering from out of doors, and flies and other arthropod pests. Populations of these pests that are located immediately outside of a specified building and pose a possible infestation problem to that building are included. General Facility Name will be inspected by name of the pest control company (PCO) for the purpose of identifying potential problem areas that may be contributing to pest infestation within the facility, making recommendations for corrective measures that should be implemented and developing a comprehensive integrated pest management (IPM) plan. The IPM plan will utilize all methods of pest control, which may include structural maintenance, sanitation, monitoring for pest populations, mechanical and biological control, and the judicious use of pesticides. These methods will help to eliminate food, moisture and harborage for pests, making their survival more difficult. Pesticides will not be applied on a routine basis; however, they may be used as a tool to maintain pest populations at or below an acceptable level. 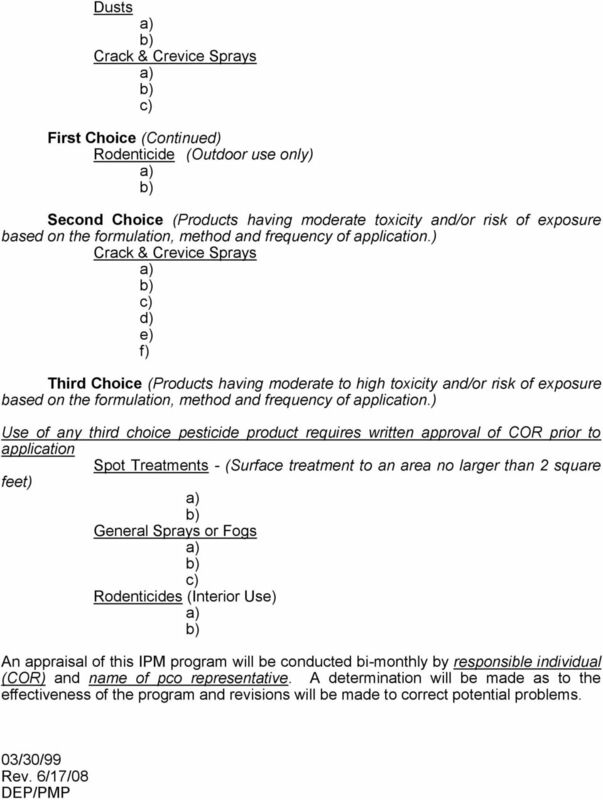 The selection of pesticides that may be used will be based on a pre-determined hierarchy, which will utilize least toxic products as first choice. Proper implementation of this program will reduce the volume, toxicity and frequency of application of pesticides, thereby reducing the risk of potential exposure of building occupants who may be sensitive to their use. The PCO and name of responsible individual - Contracting Officer's Representative (COR) shall meet to discuss areas that have been problematic or sensitive. (i.e. ; operating rooms, prisons or areas where there is a history of high pest pressure) Areas that are sensitive to pesticide use will also be discussed. (i.e. ; day care areas, elderly residence, work area of sensitive employees, etc.) 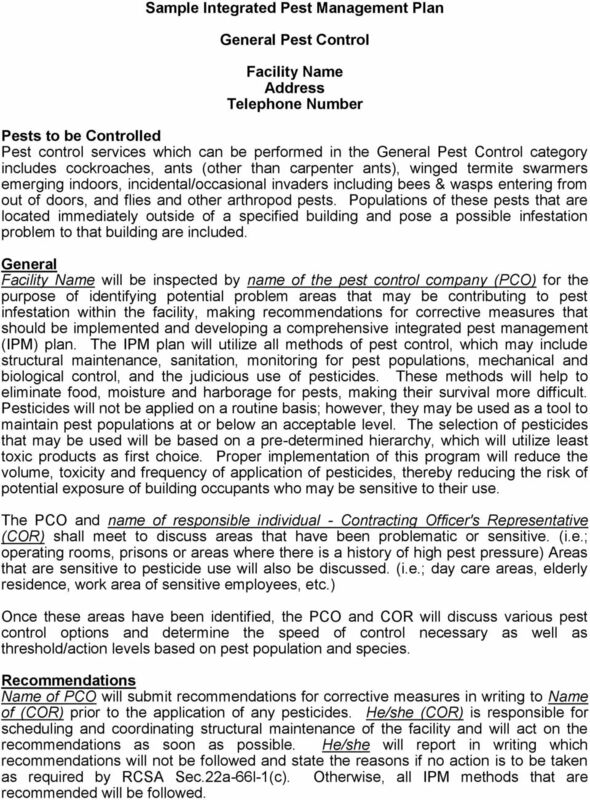 Once these areas have been identified, the PCO and COR will discuss various pest control options and determine the speed of control necessary as well as threshold/action levels based on pest population and species. Recommendations Name of PCO will submit recommendations for corrective measures in writing to Name of (COR) prior to the application of any pesticides. He/she (COR) is responsible for scheduling and coordinating structural maintenance of the facility and will act on the recommendations as soon as possible. He/she will report in writing which recommendations will not be followed and state the reasons if no action is to be taken as required by RCSA Sec.22a-66l-1(. Otherwise, all IPM methods that are recommended will be followed. 3 traps.) The pest control technician may also use flushing agents such as as an inspection tool during monitoring visits. or Pests Cockroaches Due to the fact that German cockroaches can reproduce rapidly, have been attributed to causing asthma and are known to translocate bacteria and viruses to food and preparation surfaces, their control will be a high priority. Other cockroach species are also of concern and measures will be taken to reduce or eliminate their populations whenever possible. Close and careful attention should be given to eliminating conditions that are conducive to pest infestation. All pests need food, moisture and harborage. By eliminating one or more of these, it is more difficult for pests to survive. Also, pests reproduce at a slower rate when conditions are not conducive for their survival. Food, paper goods and other supplies should be visually inspected upon arrival for cockroach infestation. Cockroaches will often hide in the corrugation of cardboard boxes. Supplies should be unpacked and stored properly and their shipping cartons disposed of as soon as possible. 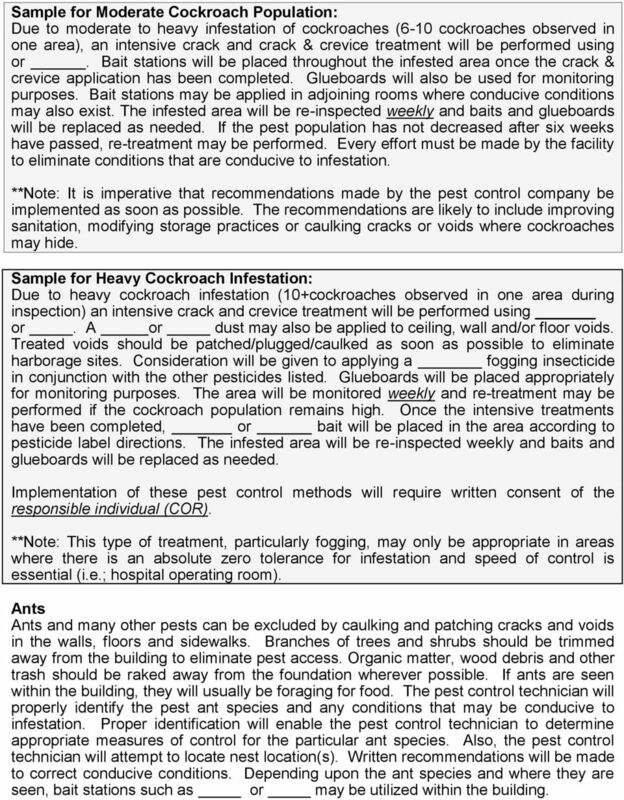 Sanitation and elimination of moisture sources is also an important factor in cockroach control. Areas where food is prepared and consumed should be swept or vacuumed daily. Particular attention should be given to areas underneath counters and appliances. Food residue should be washed off of any preparation surface or equipment. Grease residues should also be eliminated as much as possible as it is a food source and will render some pesticides ineffective. Bulk foods should be stored in tightly covered bins. Moisture sources should be eliminated as much as possible by repairing faucets, drying sinks and counters at the end of each day. 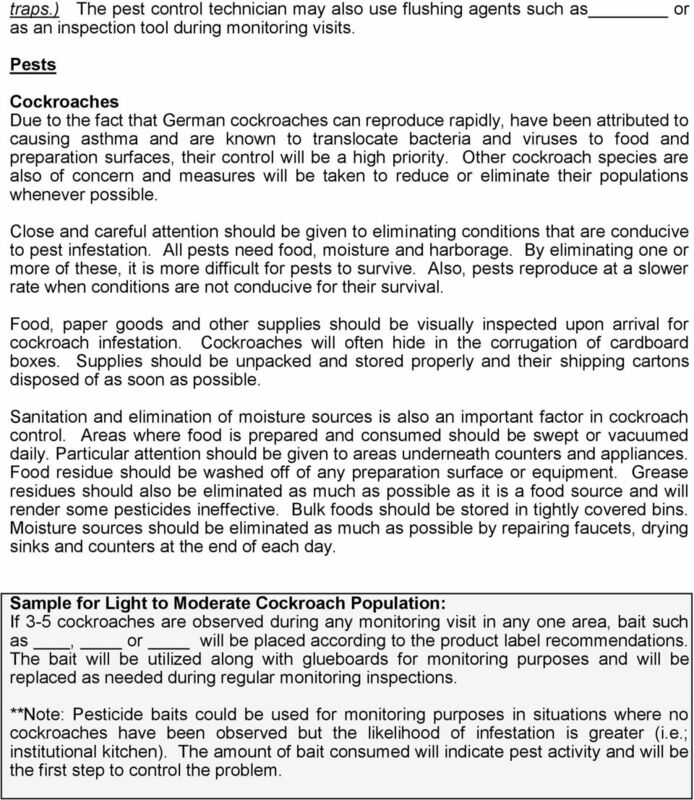 Sample for Light to Moderate Cockroach Population: If 3-5 cockroaches are observed during any monitoring visit in any one area, bait such as, or will be placed according to the product label recommendations. The bait will be utilized along with glueboards for monitoring purposes and will be replaced as needed during regular monitoring inspections. **Note: Pesticide baits could be used for monitoring purposes in situations where no cockroaches have been observed but the likelihood of infestation is greater (i.e. ; institutional kitchen). The amount of bait consumed will indicate pest activity and will be the first step to control the problem. 4 Sample for Moderate Cockroach Population: Due to moderate to heavy infestation of cockroaches (6-10 cockroaches observed in one are, an intensive crack and crack & crevice treatment will be performed using or. Bait stations will be placed throughout the infested area once the crack & crevice application has been completed. Glueboards will also be used for monitoring purposes. Bait stations may be applied in adjoining rooms where conducive conditions may also exist. The infested area will be re-inspected weekly and baits and glueboards will be replaced as needed. If the pest population has not decreased after six weeks have passed, re-treatment may be performed. Every effort must be made by the facility to eliminate conditions that are conducive to infestation. **Note: It is imperative that recommendations made by the pest control company be implemented as soon as possible. The recommendations are likely to include improving sanitation, modifying storage practices or caulking cracks or voids where cockroaches may hide. Sample for Heavy Cockroach Infestation: Due to heavy cockroach infestation (10+cockroaches observed in one area during inspection) an intensive crack and crevice treatment will be performed using or. A or dust may also be applied to ceiling, wall and/or floor voids. Treated voids should be patched/plugged/caulked as soon as possible to eliminate harborage sites. Consideration will be given to applying a fogging insecticide in conjunction with the other pesticides listed. Glueboards will be placed appropriately for monitoring purposes. The area will be monitored weekly and re-treatment may be performed if the cockroach population remains high. Once the intensive treatments have been completed, or bait will be placed in the area according to pesticide label directions. The infested area will be re-inspected weekly and baits and glueboards will be replaced as needed. 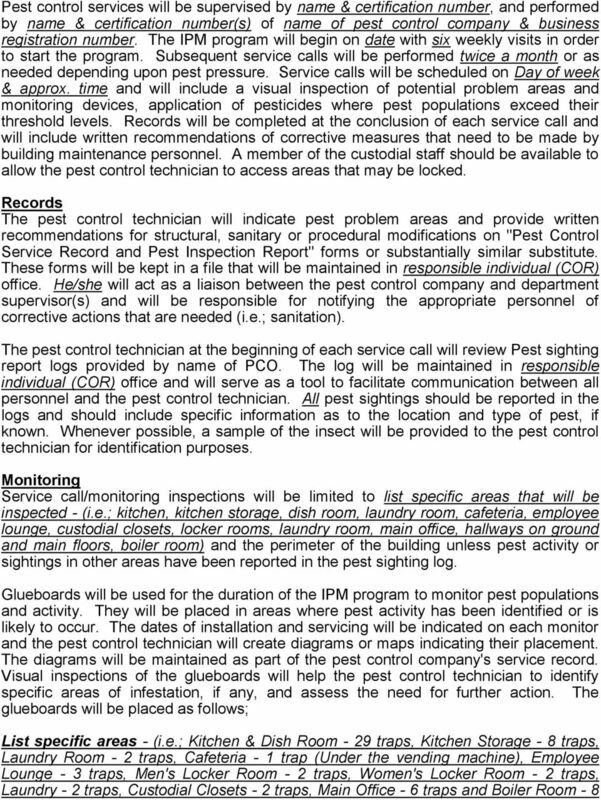 Implementation of these pest control methods will require written consent of the responsible individual (COR). **Note: This type of treatment, particularly fogging, may only be appropriate in areas where there is an absolute zero tolerance for infestation and speed of control is essential (i.e. ; hospital operating room). Ants Ants and many other pests can be excluded by caulking and patching cracks and voids in the walls, floors and sidewalks. Branches of trees and shrubs should be trimmed away from the building to eliminate pest access. Organic matter, wood debris and other trash should be raked away from the foundation wherever possible. If ants are seen within the building, they will usually be foraging for food. The pest control technician will properly identify the pest ant species and any conditions that may be conducive to infestation. Proper identification will enable the pest control technician to determine appropriate measures of control for the particular ant species. Also, the pest control technician will attempt to locate nest location(s). Written recommendations will be made to correct conducive conditions. Depending upon the ant species and where they are seen, bait stations such as or may be utilized within the building.